Before I hand over this guide to you and you start using VBA to create a pivot table let me confess something. ...to create a pivot table, it was a failure. Since then I have learned more from my bad coding rather than from the codes which actually work. Today, I will show you a simple way to automate your pivot tables using a macro code. Normally when you insert a pivot table in a worksheet it happens through a simple process, but that entire process is so quick that you never notice what happened. In VBA, that entire process is same, just executes using a code. In this guide, I’ll show you each step and explain how to write a code for it. ...and it returns a new pivot table in a new worksheet in a flash. Without any further ado, let’s get started to write our macro code to create a pivot table. For your convenience, I have split the entire process into 8 simple steps. After following these steps you will able to automate your all the pivot tables. Make sure to download this file from here to follow along. The first step is to declare the variables which we need to use in our code to define different things. PSheet: To create a sheet for a new pivot table. DSheet: To use as a data sheet. PChache: To use as a name for pivot table cache. PTable: To use as a name for our pivot table. PRange: to define source data range. 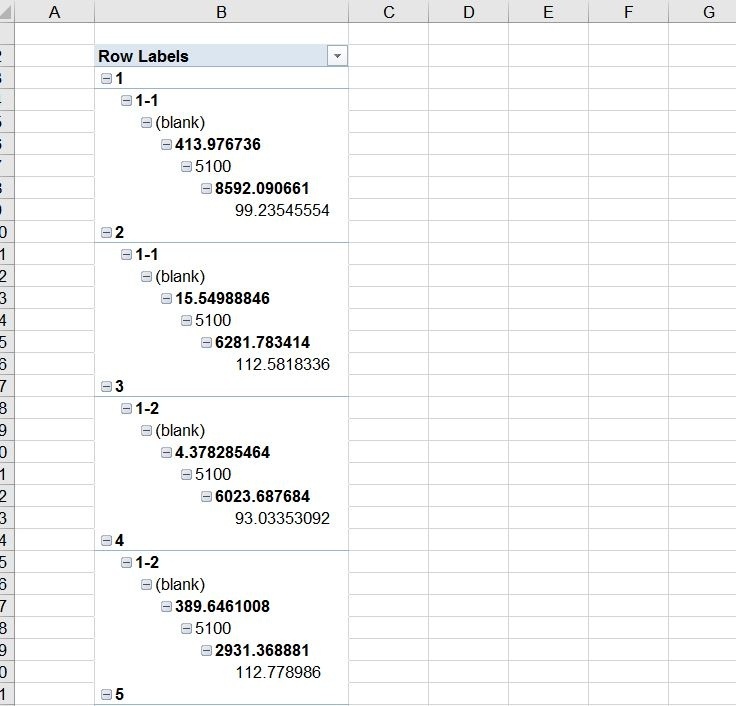 LastRow and LastCol: To get the last row and column of our data range. Before creating a pivot table, Excel inserts a blank sheet and then create a new pivot table there. And, below code will do the same for you. It will insert a new worksheet with the name “Pivot Table” before the active worksheet and if there is worksheet with the same name already, it will delete it first. After inserting a new worksheet, this code will set the value of PSheet variable to pivot table worksheet and DSheet to source data worksheet. Customization Tip: If the name of the worksheets which you want to refer in the code is different then make sure to change it from the code where I have highlighted. Now, next thing is to define data range from the source worksheet. Here you need to take care of one thing that you can't specify a fixed source range. You need a code which can identify the entire data from source sheet. This code will start from the first cell of the data table and select up to the last row and then up to the last column. And finally, define that selected range as a source. The best part is, you don’t need to change data source every time while creating the pivot table. 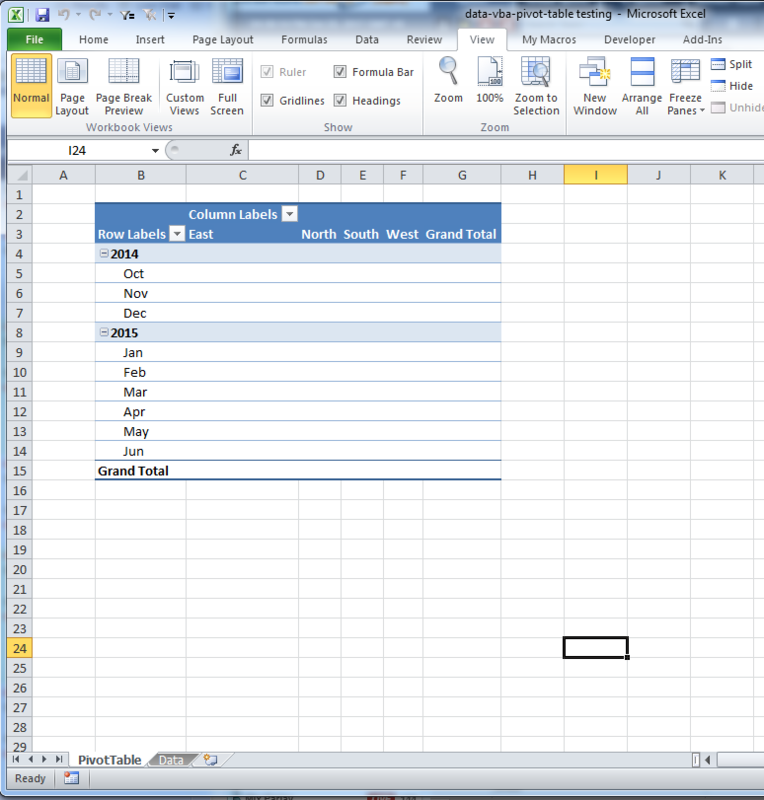 In Excel 2000 and above, before creating a pivot table you need to create a pivot cache to define the data source. Normally when you create a pivot table, Excel automatically creates a pivot cache without asking you, but when you need to use VBA, you need to write a code for this. This code works in two way, first define a pivot cache by using data source and second define the cell address in the newly inserted worksheet to insert the pivot table. You can change the position the pivot table by editing this code. After pivot cache, next step is to insert a blank pivot table. Just remember when you create a pivot table what happens, you always get a blank pivot first and then you define all the values, columns, and row. 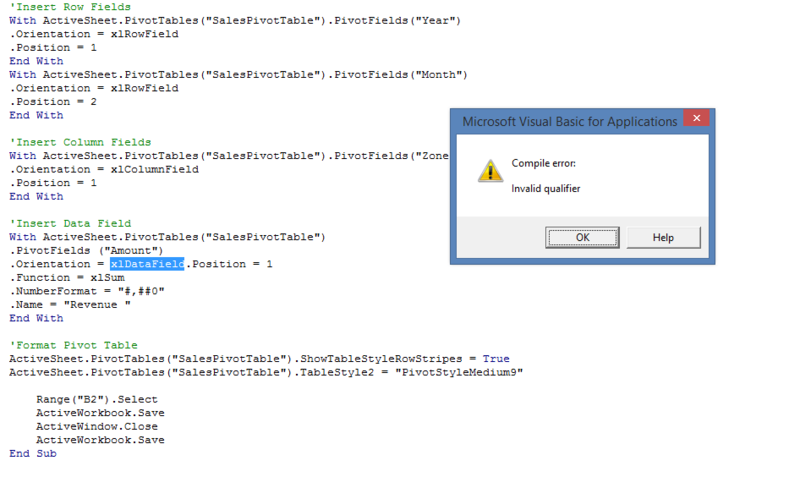 This code creates a blank pivot table and names it "SalesPivotTable". You can change this name from the code itself. After creating a blank pivot table, next thing is to insert row and column fields, just like you do normally. For each row and column field, you need to write a code. Here we want to add years and month in row field and zones in the column field. In this code, you have mentioned year and month as two fields. Now, if you look at the code you'll find that there is also a position number is there. ​This position number defines the sequence of fields. ​Whenever you need to add more than one fields (Row or Column) make sure to specify their position. And, you can change fields by editing their name from code. Now, the main thing is to define value field in your pivot table. The code for defining values is a bit different from defining row and columns because here we need to define the formatting of number, position, and function. With above code, you can add amount as the value field. And this code will format values as a number with (,) separator. We are using xlsum to sum values but you can also use xlcount and other functions as well. In the end, you need to use a code to format your pivot table. Normally in a pivot table there is also a default formatting and then you change that formatting. 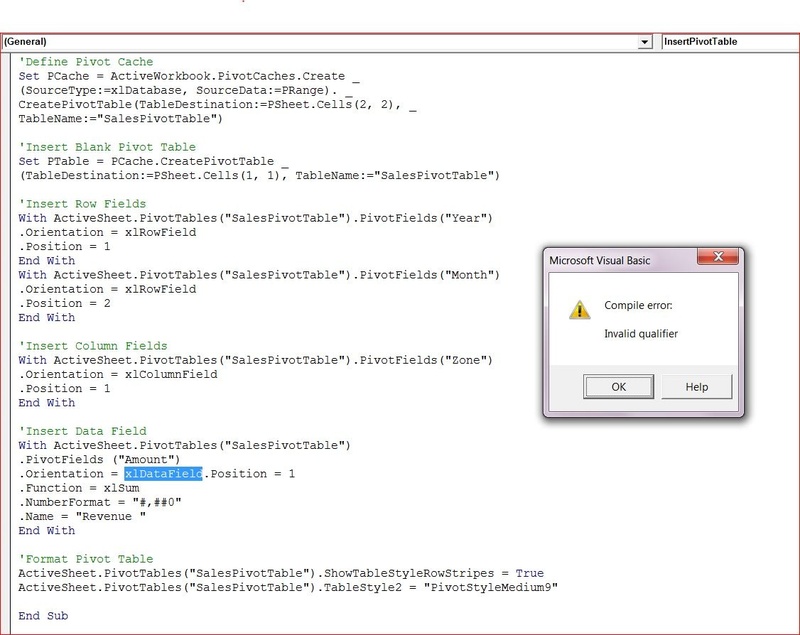 But with VBA you can define formatting style withing the code. TableActiveSheet.PivotTables("SalesPivotTable").ShowTableStyleRowStripes = TrueActiveSheet.PivotTables("SalesPivotTable").TableStyle2 = "PivotStyleMedium9"
Above code will apply row strips and "Pivot Style Medium 9" style but you can also use another style. Finally, your code is ready to use. Or, you can download these sample files from here to try it yourself. The code we have used above creates a pivot table on a new worksheet but sometimes you need to insert a pivot table in a worksheet which is already there in the workbook. In the above code (Pivot Table in New Worksheet), in the part where you have written the code to insert a new worksheet and then name it. You need to make some tweak in the code. Don’t worry, I’ll show you. Now instead of inserting a new worksheet you just simply need to specify the worksheet name to the PSheet variable. There a bit more to do. The first code which you have used creates a deletes the worksheet with the same name (if it existes) before inserting it. Now when you insert a pivot table in the existing worksheet there’s a chance that you already have a pivot there with the same name. What I’m saying is you need to delete that pivot first it it’s there. Isn’t it? So for this, you need to add the code which should delete the pivot with the same name from the worksheet (if it’s there) before inserting a new one. Let me tell you what this code does. First of all, it simply set PSheet as your the worksheet where you want to insert the pivot table and which already in your workbook, plus set data worksheets as DSheet. After that, it activates the worksheet and deletes the pivot table “Sales Pivot Table” from it. Customizations Tips: If the name of the worksheets in your workbook is different then you can change from the code. I have highlighted the code where you need to do it. Here is the full code which you can use and here is the sample file to try it yourself. Make sure to knock me in the comment section if you face any problem, I’ll try to help you with my best. By using this code we can automate your pivot tables. And the best part is, this is a one time set up and after that, we just need a click to create a pivot table and you can save your a ton of time. Have you ever used a VBA code to create a pivot table? Please share your views with me in the comment box, I'd love to share with you and make sure to share this tip with your friends. Pivot Table Timeline: The best thing about a timeline filter is you don’t need to open the filter again and again, you just do it with a.. 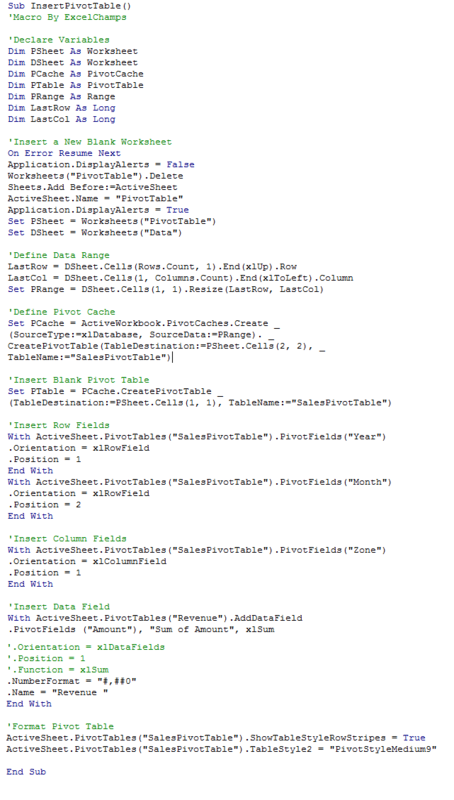 I have these two pieces of code below that put 2 fields into the page area of a pivot table. Is this possible without having to write true vs false code for each item in VBA? Any alternative code greatly appreciated. Please help in resolve the error. Hi the code works well thank you. I would like to add one more thing to it but can’t seem to figure it out. I want it to filter as per your example, 2014 only. How do I make it just show 2014 in my pivot? Don’t know if you can help but appreciate your post either way. Run-time error 13 type mismatch. Hi Punnett, this is brilliant, thank you. it wasnt working for me originally as i couldnt just copy and paste my data into a new worksheet – i had to make sure the data was set as a table. Is there anyway to build the pivot table so that “Dsheet” doesnt have to be a table – just copied and pasted data with the first row to be used as the headers? Is there any way of amending the code so that it will work any worksheet and not just worksheets that are named “Data”? You just need to change worksheet name in the code. This is great! Thank you, Puneet! I’m following up on Matt’s question. Is there any way to amend the code so I can run the macro regardless of the title on the worksheet without having to change the name in the code each time? I work with many data sets on a daily basis. Wondering if this is possible. I am having trouble setting this up; very similar, yet a bit different. I will have the button on “Paste Data” sheet and it will be pulling the data to create the pivot from “Formatted” sheet. I can email you the code if you’d like. Please advise. This is Yaakov calling. Thank you very much for your kindness. Very inspiring and interesting site; I learn a lot from it. Keep on with the good work! By the way trying your code worked just fine except for the ampunt field which did not show up automatically but i had to check it mannually. Reason? Its awesome! Can i get this to my email! Thank you so much for this. Saved me a huge amount of time. This is amazingly useful! I have been able to use it for my own work and it’s great. However, I do want to be able to nominate certain columns to go in the “Value” box of the pivot table (I need to count some cells). Whenever I try to do a “Count”, it seems to override the “insert row fields” function, so all I get is a count of the whole dataset, rather than a specific row. Any thoughts on how to get around this? This article was so helpful! I was able to adapt the names to pull a table for my data without an issue. Now my only question is, how can I get it to pull a second pivot table from the same data on to the same worksheet? Like, you want to create a new pivot table from the same source data and which need to have different fields? Correct me, if I’m wrong. How to apply filter in the field of pivot table.. Just as you added Row and Column data. Hi Puneet, I cannot get this code to create the pivot table. There are no errors when I try to run the code and all of the table names and values are correct. I also put the data into table format and that doesn’t seem to be the issue. Any assistance is greatly appreciated! Can I have a mail puneet[@]gogia[.]me ? Hi Punnet.Thanks for sharing this simple and useful code. 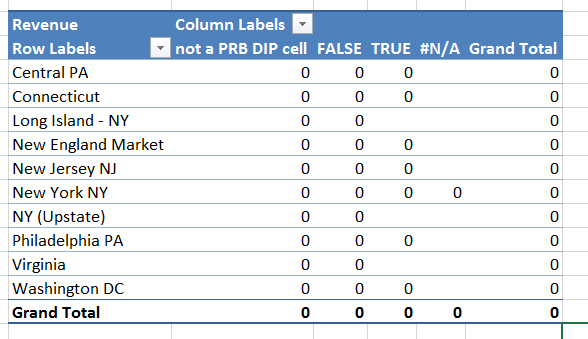 I am facing issue that if I work with less column data code works but when I add more columns then code fails i.e.Pivot table sheet is created but table is not created. Please guide. Make sure you are using an Excel table and using its name in source reference. Knock me back if you need further help. 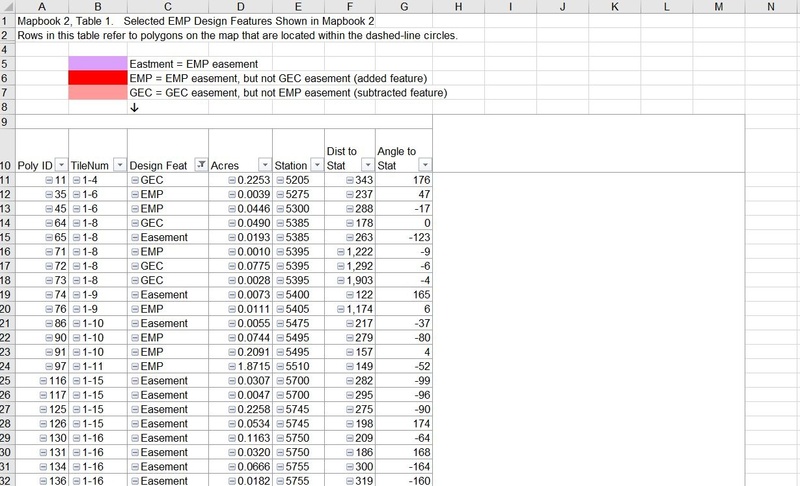 I can see the beauty of putting a macro button on the data sheet and I can see the simplicity of using VBA to find the data as the basis of the PT, however, as a test for myself, I manually created the same pivot table as you did, having first converted the data range to an Excel Table and with about four or five clicks I get my result. I don’t say you are wasting your time but what is the big advantage of doing this in VBA? Send me the Sample file pls. THANK YOU THANK YOU THANK YOU for posting this!!! You just saved me multiple days of tedious manual effort. I am having the same issue. The new tab is created but none of the data is pulled in. I need to add a filter to the vba code for pivots. how do i do that? I used your code and am trying to change it to create a pivot table with my data. I want it to look like the nice table with Poly ID, Tile Num, Design Feat, etc. in the photo, but I keep getting this instead (see photo). I’m not sure what I’m doing wrong. Can you help please? I just changed the rowfield, colfield and datafield to match my col headers. ofcourse i change the sheet name to “Data” too. i creates a new sheet but just stops there dont create a blank pivot. It would be great if you share your file with me. Can I have a snapshot of your code? pf2.PivotFilters.Add2 Type:=xlValueIsGreaterThan, DataField:=pf2Values, Value1:=0 to filter out 0 values. btw, its a good post i have been looking for sampla code for creating a pivot. Can you please share your file with me? Can I have a snapshot of your code or file? here is the snapshot of the code. correct the second last section of the code where three lines are written as comment..
Doesnt Work for rows > 65000. I dont know whats the issue..!!?? Copy pasted right into the file YOU provided, and 15+ errors. Are you sure you know what you’re doing? Hahaha, thanks for the comment. Can you please share your errors with me? It’s working fine on my side. Hi, a used this code but nothing happened. It dont create any pivot table in my excel. What could cause that? 🙂 any solutions ? You need to edit code as per your data as I have mentioned in the post. I have one problem 🙂 I am recording my macro(doing pivot) as I don’t know Vba. So the problem is that after I run macro the pivot comes out without lines, only total number(one line). Do you have any ideas what it can be ? Can’t say this way. You need to share your file with me. Please share your file with me ==> puneet@gogia.me. If possible. Other wise share a snapshot for of your raw data. Sorry, Jatinder didn’t get. Please share again. @zackery_brady:disqus please share a snapshot of your macro code which your are using. Hi even i get the same error what to do with it? Amazing blog !! i learned a lot.. I am facing this same error on the same line of the code.. Do we know what the solution ? The reason for this is probably that (possibly in newer versions of Excel?) it doesn’t even get assigned a real value, it stays Nothing. I suppose you are aware of this, since you use ActiveSheet.PivotTables(“SalesPivotTable”) wherever you would normally use PTable. Actually PCache, too, stays Nothing so this approach doesn’t really need those variables. I find this approach more suitable. How will open a exl file from particular location with a only keyword of that file, and save it to other location using vba? Hi there! Just used your code and it worked perfectly! Thank you so much for sharing and then breaking it down so that I can actually learn from it! Hi, I used this data to create my pivot tables. This worked perfectly until I had a large number of rows. I have 220,000 rows. I can create the pivot manually but not using the macro. If I reduce this same data down to 45,000 rows it does work perfectly. Any ideas? I’ve used this code for 131897 rows without any problem. I’m wondering why you got that issue. Please share your data if possible. Hey Jonathan debug your code & send me a screen shot at puneet@puneetgogia.com. You have to change data source to external. Creating pivot table for external data source, can you please provide sample code .? Excellent Blogpost! Do you also have any such blog for Pivot Chart? Hi, Thanks a lot for the code. It is working fine. However I would like to create one more pivot in the same sheet. What should i do. I tried to declare and repeated the whole code, however receiving error msg. Could you please advise. Below is the code which am trying. I’m sorry for my super late reply. 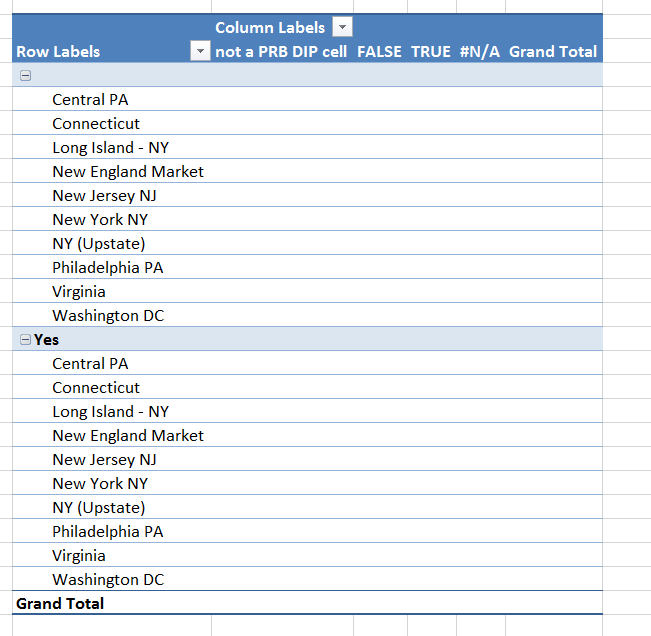 yes, you can use the same data to create a second pivot table but first you have to specify the cell in the same worksheet on which you want to insert that second pivot. I’ll appreciate if you share your file. Info@excelchamps.com. I’ll appreciate if you share your file or code. Hi I’m not sure what is happening. I used your code but subbed in my own names for the different fields. When I run the script, a new sheet is created but nothing happens. Can you please help me? hello, I m starting with your code, I ll adapt but i have a question. Why do i need to delete first the wsheet before creating the new pivot table, and not deleting the old one and using the sheet?? It’s all up to you, Jose. If you down want to delete that sheet, you can just delete the pivot table from the sheet.